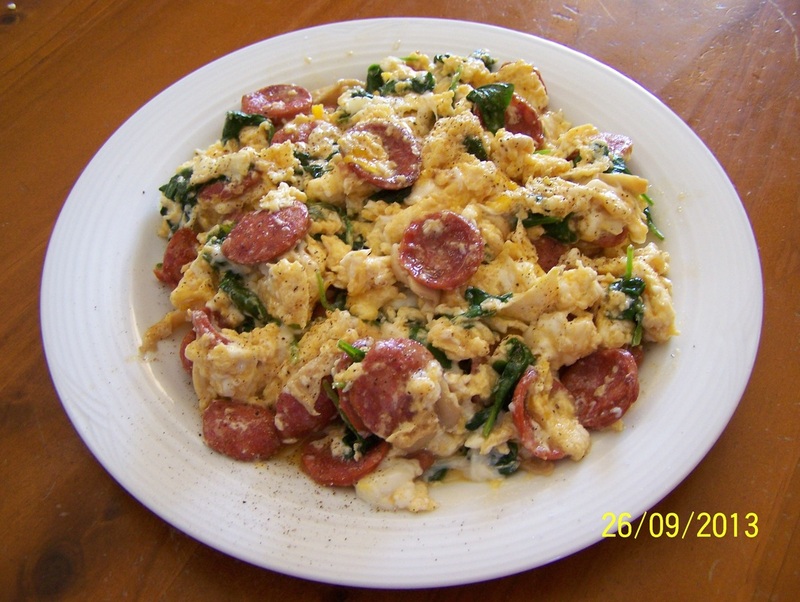 This is a great dish for breakfast, lunch or dinner. It is quick to make and full of flavour. We love scrambled eggs in my house and by adding a few other things to eggs you get great dishes that are quick and easy to prepare. This is something that I like to make when the kids are on school holidays. My kids will not eat a sandwich during the school holidays, they want both cooked lunches and cooked dinners. So this is one of those meals where the kids call out that they are hungry, and you start looking in the refrigerator to see what you can offer. I used chorizo here but it could just as easily have been bacon in the refrigerator, or asparagus instead of spinach etc. Give this a go when you are time poor, or when it is time to clean out your refrigerator. Add a little oil to a frying pan. Add the chorizo, over medium heat, cook the chorizo for 3-4 minutes. Add the mushrooms and shallots, cook for 1 minute. Add the spinach and cook until it is wilted. Crack the eggs into a large bowl, do not scramble them. so don't over mix it. Season generously with salt and pepper, or to your liking. before the eggs are completely cooked, as the residual heat keeps cooking the eggs. Serve with crusty bread and fresh cherry tomatoes. Season again if needed.